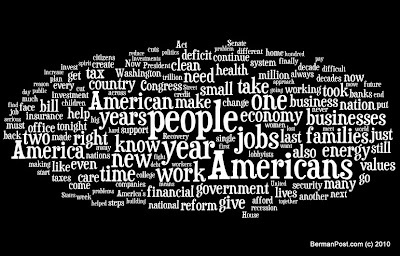 This is the word cloud of Obama's State of the Union Address. I and me appear to be missing. Common words are excluded automatically (http://www.wordle.net/faq#stop). But "I" and "me" are not common in SOTUs. Except this one. Namazu said: "Is it possible to trick the program by substituting (say) 'eye' and 'mee'? Yes, it is. Just replace ' I ' with ' eye ' and ' me ' with ' mee ' - single spaces on either side of the words. I did it, and also went back in time and did it for a random selection of SOTUs all the way back into the 1800s. It's interesting. "Suckers" seems to predominate a lot more from Woodrow Wilson onward. "Imperial Presidency", indeed.